Shepherd Neame pub at the Locksbottom end of Farnborough. It's divided into a few areas inside. Entry is dominated by the bar, and seating winds around to the left and back, ending in a small cosy area with a large flatscreen. More seating can be found to the right of the bar, with tables and chairs for drinkers, a padded window seat for perching, a sofa and a couple of armchairs, and a door leading to the garden. Further in there's a dining area set with cutlery and napkins. There's very little natural light anywhere, and the lighting is kept dim, provided by recessed spotlights and yellowish wall-mounted lights. A small bookcase with board games is tucked away to the side of the bar, and several shelves of paperbacks sit next to the door to the garden. The garden itself is reasonably sized, and partially covered. Kake visited on a Thursday lunchtime in September 2013. There were half a dozen other customers in when I arrived around noon, some having food, most just drinking and reading the paper. Music was playing, bland and slushy, not too loud. The handpumps were clipped for Spitfire, Queen Court Harvest Ale, and Master Brew. A half of lime and soda was 50p. They have free wireless via The Cloud (free registration required). Food is served lunchtimes at least, from a regular menu photo 1, photo 2 plus a specials board. 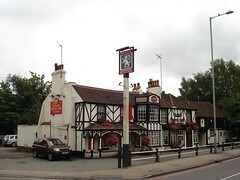 Child-friendliness: A sign on the door warns that nobody under 14 is allowed anywhere in the pub, including the garden. Accessibility: No step to get in, just a small ridge, and it's step-free to the bar, seating, and accessible toilet. Not sure about access to the garden. Last visited by Kake, September 2013. Opening times taken from the Shepherd Neame website, September 2013. Last edited 2013-09-14 22:15:56 (version 10; diff). List all versions. Page last edited 2013-09-14 22:15:56 (version 10).